The operative technique and the results of the first 50 patients of hybrid cholecystectomy are fully described. 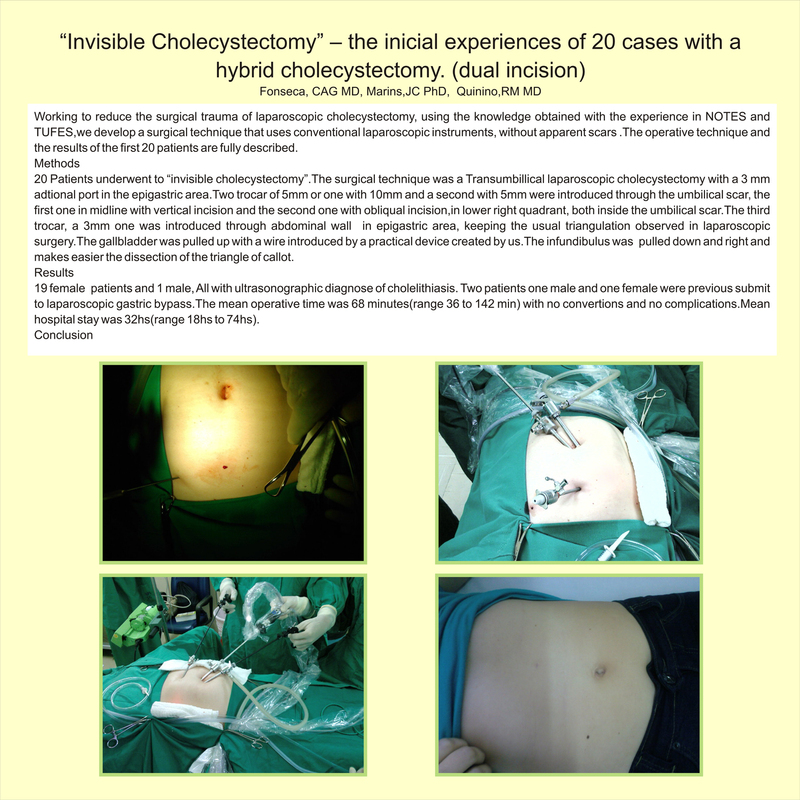 50 Patients underwent to “invisisible cholecystectomy”.The surgical technique was a Transumbilical laparoscopic cholecystectomy with a 3 mm aditional port in the epigastric area.Two trocar of 5mm were introduced through the umbilical scar, the first one in midline with vertical incision and the second one with obliqual incision,in lower right quadrant, both inside the umbilical scar.The third trocar, in epigastric area, keeping the usual triangulation observed in laparoscopic surgery.The gallbladder was pulled up with a wire introduced by a practical device created by us.The infundibulus was pulled down and right and makes easier the dissection of the triangle of callot. 42 female patients and 8 male, All with ultrasonographic diagnose of cholelithiasis. Two patients one male and one female were previous submit to laparoscopic gastric bypass.The mean operative time was 58 minutes(range 36 to 142 min) with no convertions and no complications.Mean hospital stay was 28hs(range 18hs to 74hs). The Knowledge obtained with the study of NOTES, TUFES, and LESS can be, and must be used in laparoscopic cholecystectomy to reduce operative trauma and improve cosmetic results. The use of conventional laparoscopic instruments, and keeping trangulation makes easier to introduce the advances in current surgical practice.The hybrid procedures are a important bridge in the way of NOTES and LESS in current surgical practice.The wire traction is a practical and easily reproductive device that can be used also in NOTES,TUFES and LESS.